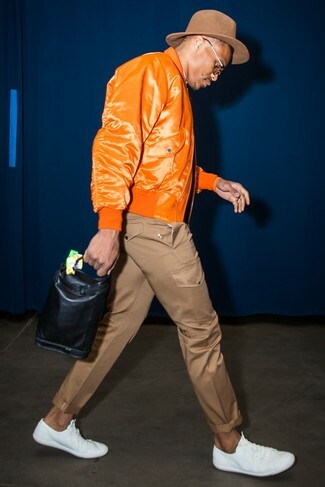 If you're searching for a casual yet sharp outfit, consider teaming an orange bomber jacket with brown chinos. Both garments are totally comfortable and will look great paired together. Make Blackstone pm56 low top sneaker from Nordstrom your footwear choice to make the getup more current. This pairing of a light blue suit and a light blue crew-neck t-shirt is so easy to throw together in seconds time, helping you look on-trend and ready for anything without spending too much time rummaging through your collection. 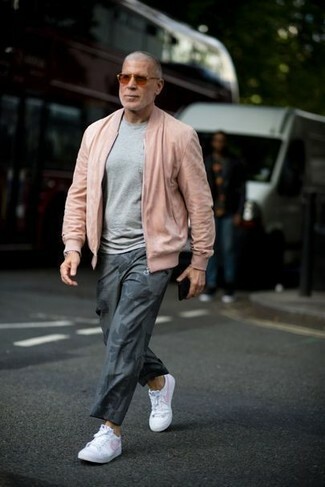 For something more on the daring side to complete this ensemble, make white leather low top sneakers your footwear choice. 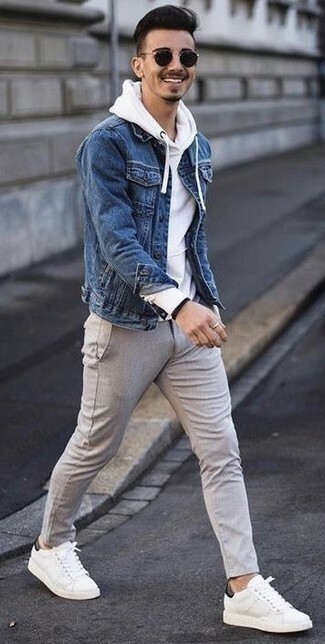 If you're in search of a casual yet stylish look, wear a blue denim jacket with grey wool chinos. Both garments are totally comfortable and will look great paired together. Blackstone pm56 low top sneaker will add more playfulness to your outfit. If you're in search of a casual yet stylish look, wear a pink bomber jacket with grey print chinos. Both items are totally comfortable and will look great together. When it comes to shoes, this look pairs wonderfully with Blackstone pm56 low top sneaker from Nordstrom. If you're on a mission for a casual yet dapper ensemble, dress in a mint long sleeve shirt and white shorts. Both items are totally comfortable and will look great together. When it comes to footwear, this getup is finished off nicely with Blackstone pm56 low top sneaker. 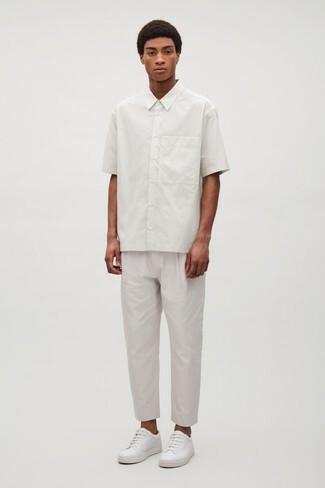 If you're on a mission for a casual yet dapper getup, consider wearing a white short sleeve shirt and white chinos. Both garments are totally comfortable and will look great paired together. As for the shoes, opt for a pair of Blackstone pm56 low top sneaker from Nordstrom. If you're scouting for a casual yet sharp outfit, rock a mustard hoodie with navy jeans. Both items are totally comfortable and will look great together. When it comes to footwear, this outfit is finished off really well with Blackstone pm56 low top sneaker. 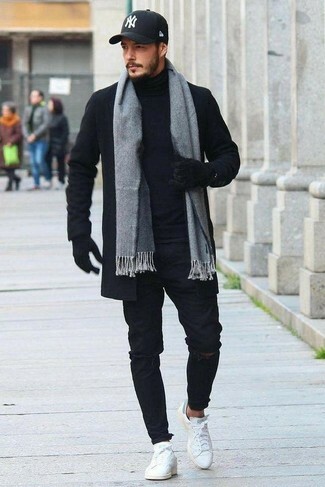 If you're on the lookout for a casual yet stylish look, go for a black overcoat and black ripped skinny jeans. Both garments are totally comfortable and will look great paired together. When it comes to shoes, this outfit is round off nicely with white leather low top sneakers. 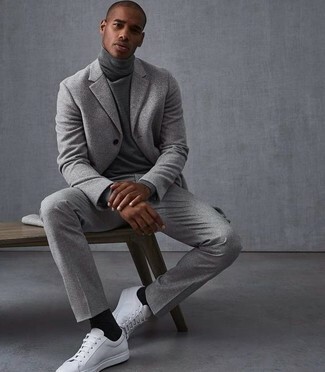 Team a grey wool suit with a grey turtleneck for incredibly stylish attire. 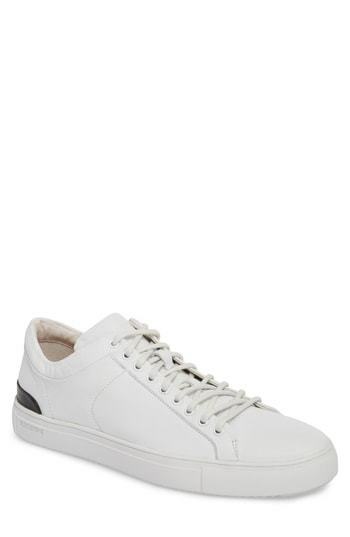 Break up your getup with more casual shoes, like this pair of white leather low top sneakers.